SCI Technology’s Data Concentrator Unit (DCU) collects and converts analog flight data into informative digital readouts for aircraft pilots. The DCU provides real-time data such as engine and transmission oil pressure and temperature, allowing pilots to know the exact performance of the aircraft’s systems at any given moment. Compact, lightweight and low-powered, the DCU provides a single, high-density conversion interface for any Aircraft Management System (AMS). Due to its flexible design, the DCU works seamlessly with an array of inputs and outputs from an aircraft’s equipment and sensors, including discrete, analog and avionics bus data. The DCU is easily configurable to meet any platform’s unique needs. Originally designed for the Army’s Common Aviation Architecture System (CAAS), the DCU is a mature unit that is proven, reliable and widely fielded on a variety of platforms. Viability and currency have been maintained through SCI-supported obsolescence management and refresh efforts. The DCU is fully qualified to MIL-STD-810, MIL-STD-704 and MIL-STD-461 as modified by ADS-37A-PRF. The DCU also meets the lightning requirements of RTCA/DO-160-22, and is manufactured to MIL-E-4400, Class 1A. While the dual-redundant 1553 RT interface is the primary means of communication for the DCU, it implements several other buses. The DCU transfers information between the 1553 MUX bus, ARINC-429 and EIA-422 serial interfaces, KY-100 serial bus and KY-58 MUX bus. 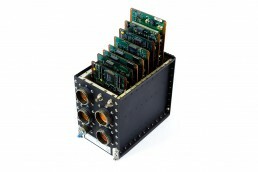 The DCU can store up to 32 different configurations in its non-volatile memory. Each configuration is accessible by either the AMS or built-in configuration straps. In a typical setup, two connected DCU units work in parallel to provide a fault-tolerant system for collection and distribution of inputs and outputs.